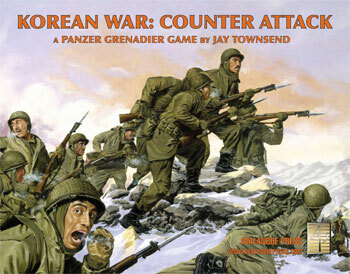 Editor’s Note: We began our trilogy of Panzer Grenadier boxed games covering the battles of the Korean War with Korean War: Pusan Perimeter, and it continues with Korean War: Counter Attack. Designer Jay Townsend picks up the story as Counter Attack’s scenario set begins. The United States/United Nations Forces have withdrawn behind the Naktong River at this point and have gathered a strong enough force to go on the offensive for the first time. But the North Koreans, even after being pounded by U.N. airpower, are still a strong fighting force and unafraid to go head-to-head with the Americans on the Naktong River, even crossing it in several locations before the Americans pushed them back. The early scenarios from Korean War: Counter Attack show both sides attacking in these fierce engagements with the outcome still in doubt, even with the arrival of strong U.S. reinforcements. With more troops arriving the battlefield turns into a stalemate, yet the North Korean People’s Army is still able to conduct offensive operations until the new United Nations commander, Gen. Douglas MacArthur, launches his “end-around” amphibious landings at Inch’on. That bold stroke finally breaks open the Pusan Perimeter, allowing the U.N. forces to drive north about a week later. In the Seoul and the surrounding areas, the NKPA put up a good fight against the American Marines. Once their resistance breaks, the 8th Army (including Republic of Korea, or ROK, forces) races north in pursuit, with units competing for distance covered and prisoners taken. P’yongyang, the North Korean capital, falls as the Allies race north to the Yalu River on the Chinese border. Though their supply lines are badly over-stretched, the Allies hope to finish the war quickly, ignoring warnings the Chinese buildup that forms the background of the Korean War series’ third game Intervention. Before the Chinese attack, the United Nations looked to be victorious. A survey below the 38th Parallel showed over 239 destroyed T34/85 tanks and 74 destroyed SU-76 self-propelled guns against 60 destroyed US tanks. The fighting had been heavy and casualties high but the NKPA was now broken and in full retreat while the United Nations had built up what looked to be a very strong Army. But in the Korean War, the tides of war constantly shift. Counter Attack picks up where Pusan Perimeter left off, as American and ROK forces are still being pushed and probed across the front as mentioned above. The North Korean political leadership is pushing their armed forces to finish conquering the whole Korean Peninsula. North Korean Premier Kim II Sung had set August 15th as the date for the final victory and liberation of all Korea, even with the growing American strength. The NKPA drive on the Pusan Perimeter from the west along the Chinju-Masan Corridor compelled American Gen. Walton Walker to concentrate all the reinforcements then arriving in Korean for a counter-offensive. Reinforcements included the 5th Regimental Combat Team, 1st Provisional Marine Brigade with supporting tanks and artillery. The Eighth Army’s greater strength in the southernmost corner of the Perimeter led Walker to attack in this area, the first American counterattack of the war. Up to this point, the American and ROK troops had been falling back to buy time to build up their forces, and the Pusan Perimeter had contracted about as much as it could before it would be lost to the enemy. With the enemy supply lines stretched, and those forces having finally arrived, the time was right to go on the counter-offensive. But the NKPA forces are far from dead and have committed over 250 tanks and self-propelled guns to support their own troops. But now the Americans have more than just the light M24 tanks: they receive M4/76 Sherman tanks, M26 Pershing Tanks and some M46 Patton tanks in later scenarios. There are 62 scenarios , including Task Force Kean, The Bloody Gulch and The First Battle of the Naktong Bugle, which in my opinion should stand out as one of the famous battles of American history if the media in 1950 had covered it more thoroughly. There’s also The Taegu Front, The Bowling Alley, Battle Mountain, The Great Naktong Offensive and the famous Marine amphibious landings at Inch’on with some cool amphibious craft and vehicles. Plus The Highway to Seoul, Battle of The Barricades, Task Force Lynch, The Fall of P’yongyang and Death of The 239th Regiment. This package includes a few British units, more to be added with the Allies supplement later. It also adds U.S. Marine forces. It has the NPKA attacking fiercely followed by a stalemate situation with both sides defending or counter-attacking until the Inch’on landings open things up for the American/British/ROK forces to push north even using a parachute attack to attempt to trap large NKPA forces. The NKPA add some captured 75mm Recoilless Rifles, 40mm AA guns and bazookas to the mix of new unit/counter types. The underwater bridge markers will also make their appearance and help both sides (especially the communists) camouflage man-made bridges made of sandbags, logs and other materials just under the water’s surface, not easily detected from the air. Counter Attack gives both sides the chance to attack or defend, plus head-to-head engagements, pursuits, amphibious landings, a seaborne evacuation, an airborne drop, Infantry fights, tank-to-tank battles, urban assaults and hill conquests. Scenarios range in size from small to large. I feel this will be another winning entry in the Korean War mini-series. Intervention will be the next/third game and will pick up where Counter Attack leaves off. Counter Attack should be a must-buy for Korean War fans and Panzer Grenadier fans or just players wanting to try out a new game. I think it will be a blast, no pun intended!